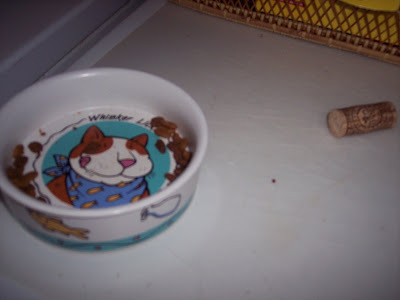 Bella has eaten the same kitty food since we got her several months ago. On my last trip to Wally World they were out of her regular food and I was forced to buy another brand/flavor. Upon filling the bowl with her new food, Bella scarfed this stuff down like it was Godiva chocolates........I fill her bowl to the top every morning and what used to last the entire day and evening is now pretty much gone by lunch time!! SO.......I get up this morning, go to the laundry room to fill the feline food bowl and this is what I found!!! We are not big drinkers in this household....(although come to think of it maybe we should drink more)!! LOL!! I have a basket of wine bottle corks that I have saved from the various dinner parties we have had over the past few years...needless to say there aren't too many corks. I have had this basket on my counter since day one of bringing Bella home. NOW......I'm not sure if Bella "snagged" one of these corks on her nightly episodes of pillaging, "killed" it and is laying it out for my approval or if she is trying to let me know that she would like a nice bowl of Merlot to go with her new food!!!!! LOL!!! Can anyone recommend a nice Merlot to go with Purina One???? LOL!!!!!!! Happy Thanksgiving And A Good Trade!!! Isn't this a beautiful view? This picture was made early this morning!! 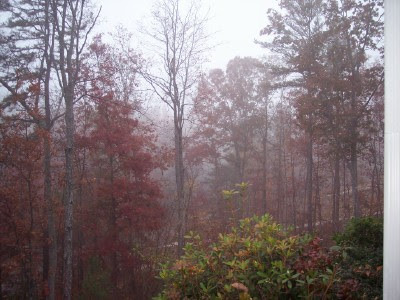 I love how the fog looks swirling through the trees!!! The day started out with such anticipation for me!!! I could barely sleep last night......you would think it were Christmas Eve!!! You see........I have (or had) some of these in my butler's pantry. Waterford Crystal....BEAUTIFUL....but I'm more a pottery kinda gal myself!!! So I sold six of these in less than 24 hours on Ebay, took the money, went on a little drive this morning through the countryside to Montevallo.....SUCH a beautiful drive there with all the fog, beautiful colored leaves, the farm land!!! It just looks like heaven to me!!! I would love to live in Montevallo!!! But....more on my destination. All roads were headed to this little baby!!!! I am just so darn tickled I can't stand it!!! You give the wheel a tiny push....and it's like BUTTAH.....I tell you.....like BUTTAH it is so smooth!!!! Tradition takes first place this evening!! 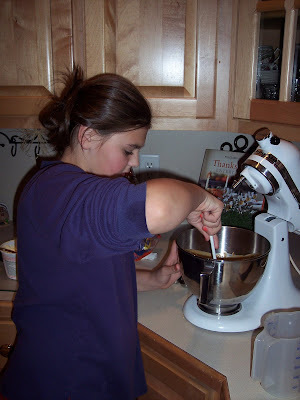 The Cupcake is in the kitchen, making the Pumpkin pies that her great, great Grandmother used to make.......all six of them!!! She is QUITE the good cook!!!! So much so that I am practically in her way!!!! So....I'll leave you with this vision of loveliness!!!! I wish you all a most wonderful and Happy Thanksgiving!!! Chorus from the Hymn Count Your Blessings!! I know I am counting mine!!!!!!!!!!! Emily suggested that all the Alabama Knit Bloggers participate in a No HASSLE, NO TREE required ornament swap for the Holidays!! What a GREAT idea this was!!!! 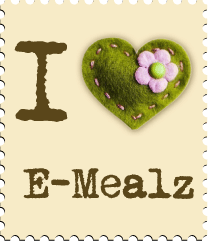 Emily made this AWESOME button for us to all post on our blogs!!! Just in case you didn't receive the initial EM or haven't had time to read your EM here's the deal: If for any reason you missed the cut off of Midnight last night and still want in......leave a comment or EM no later than Friday by midnight and I'll pull some strings and get you in!!! LOL!!! You are invited to participate in an Alabama Holiday Ornament swap, NO TREE REQUIRED….ornaments are for every occasion (they also look great hanging from kitchen cabinets, etc). This is going to be an easy, hopefully fun swap for everyone!! A) Cut off date to sign up is midnight Wednesday, November 14th. (Amended to Friday, November 16, midnight. B) Cost: $ 10 including the cost of making the ornament, shipping and any goodies you might want to add. C) Ornament stats: need to be shipped to arrive no later than December 14th. D) Your ornament doesn’t HAVE to be knitted (but there are a lot of free patterns available on the web and don’t think you have to knit something elaborate…sometimes simple is the best ).........besides, you may end up a fabulous knitter, publish books and your partner might have one of your very first knitted items, VERY collectable!!!! BUT……If you are a new knitter and don’t feel comfortable knitting an ornament perhaps a creative knitting related type ornament!! E) This will be a secret swap. F) If you would like to participate, please confirm by returning this em along with the completed questionnaire. Everyone will be assigned a secret pal and I will EM you with your pals info!! 1. What winter holiday do you celebrate? 2. What is your favorite holiday snack, candy, etc? 4. Anything you would like to add that might help your secret pal? 5. What is your snail mail address? 6. What is your em address and blog address? Cindy's wheel is due to be delivered TOMORROW!!! But it is a Christmas present so she won't get it till Christmas morning!!!! 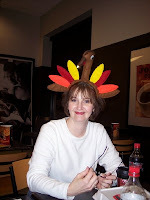 Check out her blog...she is absolutely TICKLED to pieces and I am so excited for her!! Even if I am just teensy weensy bit jealous....this is a N.I.C.E. wheel!!! Double drive and will carry her from beginning spinning though any fiber she should want to spin without having to purchase any additional upgrades. Cindy ordered her wheel with the Walnut finish. I also haven't had a chance to spin on Bibby's new wheel either!!!! Bibby got the Ashford Traveler double drive!! I L.O.V.E. this wheel !!!!! 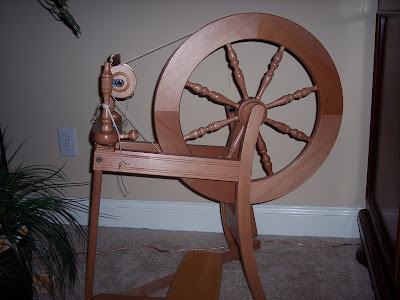 I love the larger treadles, I just like everything about it!!! Bibby ordered her's unfinished so she could finish it like she wanted......which she did an awesome job!!! about buying a used Ashford Traditional wheel......I like the clean looks of this wheel and it doesn't take up much space. I typically don't like anything modern looking....I like traditional or antique....which the Kromski Prelude is an awfully big temptation.....but this one has the option of ugrading to a double drive if I so choose in the future. I have been VERY happy with my little Kiwi, so much so that I don't want to part with it!!!! I guess this is how folks end up with several wheels!! We'll just have to see.....it is getting close to Christmas and if I had known before SAFF I wouldn't have spent all my mad money there....but this is a really good deal and I hate to pass up a good bargain!!! Please feel free to share your thoughts about the Traditional if you have one or know someone that does!!! I am on the fence about what to do!!!! !